Good Cause Wellness Organic Hemp Seeds, 2 lbs. 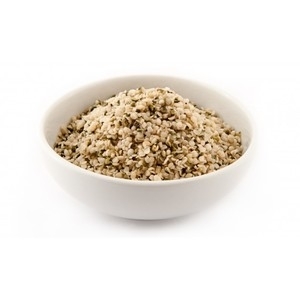 Organic Hemp Seeds are soft seeds that add nutty flavor and protein, fiber and essential fatty acids to any meal. Organic Hemp Seeds are the ultimate life-sustaining food. They are nutritionally complete and perfectly balanced. Hemp Seeds are non-GMO. As with all hemp products imported to the U.S., our hemp seeds are tested and validated to contain 0.00% THC, so they will not cause a false positive drug tests or psychoactive effects. In addition to its nutritional values, hemp is one of the most sustainable crops, providing a wide variety of raw materials that can replace unsusatainable fossil fuel waste, virgin forest extraction, and intensive cotton production. Hemp is a complete protein source providing all the essential amino acids. In fact, its total protein content is 33% (about as much as soy). Hemp Seeds provide essential amino acids like arginine (12%) and histidine (27%), which are important for childhood growth and development. Hemp also contains the sulfur amino acids methionine (23%) and cysteine (16%), which the body uses to build enzymes. Athletes and body-builders love hemp for its fairly high levels of the branched-chain amino acids. Hemp is particularly rich in a protein called globulin edistin (65%) as well as albumin. These proteins are structurally similar to those in human blood plasma. These proteins prime the body to produce proteins called gamma globulins, which are crucial components of the immune system. Hemp seeds are very low in starches and sugars so they are perfectly suited for low-carb diets. Hemp seed's minimal carbohydrates comes primarily from fiber. This fiber is both soluble and insoluble, making it optimal for supporting both digestion and heart health. Hemp seeds are cholesterol-free. They naturally increase the amount of good fats your heart needs to thrive while drastically cutting the bad fats that can cause heart disease and high cholesterol. These effects may be due to hemp seeds' content of beta-sitosterol, which inhibits cholesterol absorption. The ratio of omega 3s to omega 6s is very important to vital body functions. Average diets contain far too much omega 6, with almost no omega 3. Too much omega 6 can lead to chronic inflammation, immune deficiency, cardiovascular disease, hormone imbalance, and possibly neurological problems. Regular consumption of omega 3 fatty acids have been shown to reduce the risk of strokes and heart attacks, as well as protect brain cells from progressive diseases like Alzheimer’s and Parkinson’s disease. Hemp seeds may also help fight off symptoms of anxiety and depression. Although seafood is a major source of omega 3, seafood is increasingly loaded with toxins and depleting our oceans. This is why plant-based sources of omega 3 (chia, flax, sacha inchi, hemp, walnut, spirulina) are becoming increasingly popular as a way to counteract high levels of omega 6. Unlike chia and flax, which are high in omega 3 and low in omega 6, hemp seeds offers the perfect ratio of omega 3 to omega 6. As long as you're not already consuming too much omega 6, then hemp may be the perfect way to maintain a balanced intake of these two essential fatty acids. You can also investigate cutting down on consumption of other omega 6 sources (such as nuts) and replacing them with hemp seeds. Hemp seeds' balanced omega 3/omega 6 levels may not be the only source of anti-inflammatory effects. Beta-caryophyllene, another substance found in hemp oil, seems to also have anti-inflammatory benefits. Hemp seeds contain the rare omega 6 gamma-linoleic acid (GLA), which the body coverts into prostaglandins, which may also help to regulate inflammation. A study in Finland demonstrated that regular consumption of Hemp seed oil increased blood concentration of essential fatty acids and significantly improved symptoms of atopic dermatitis (itchy, inflamed skin). Due to GLA's effects on a special fat called brown adipose tissue (BAT), many studies suggest that it can increase metabolism and weight loss. This effect may also be due to GLA's interaction with the body's sodium potassium cellular pump, possibly increasing calorie burning at the cellular level. Unlike soy and many grains and seeds, hemp seeds have no phytic acids–the anti-nutrients that block mineral absorption. While many vegans and raw foodists soak nuts and seeds to enhance digestibility, that's unnecessary with hemp seeds. Just eat them by the handful or add to smoothies and meals throughout the day. How Are Hemp Seeds Grown and Harvested? Our hemp seeds are grown in Canada. Our supplier works with a group of about 20 hemp farmers, who are also shareholders in the company This relationship not only rewards the hard work of these caretakers of the Earth, it also motivates them to keep quality, flavor, and nutrition as high as possible. Our organic, GMO-free hemp seeds are harvested, pressed, packaged and stored with utmost attention to ensure premium nutrient content and freshness. After harvest, the hemp seeds (in-shell) are collected in a state-of-the-art processing facility for grading and storage. The seeds' hard outer shell is machine-cracked and run through a series of mesh sequences that separate the shell from the nutritious inner kernel, or the "hemp heart" as it's sometimes known. All this is done at raw temperatures to protect delicate omega oils from oxidation. Batches are regularly tested for purity and quality. It's best to store hemp seeds in an airtight container in the refrigerator or freezer.